This post is a collaboration with my good friend Bob Wegner, a professional musician, amateur astronomer, and genuinely good person. With the New Horizons spacecraft passing Ultima Thule on New Year’s eve 2019, Bob and I noticed that Queen guitarist and astronomer Brian May was on hand for the live event, playing a newly-written song to mark the event. Bob and I often talk about astronomy, as I’m always interested in his perspective as an enthusiast, while he’s equally interested in my opinion as a professional. We decided to take this event and write about it from two perspectives. For Bob’s great piece on Brian May, go here! This is the astronomer’s perspective. 2006. January 19th. 2pm. I was sitting in my apartment as a third year Physics student at McMaster University in Ontario, watching the web-streamed launch of a rocket containing a very important payload – the New Horizons spacecraft, aimed at Pluto and expected to arrive after 9 long years. At the time the best photo of Pluto was a blurry yellow blob from Hubble. The best pre-2015 image of Pluto. 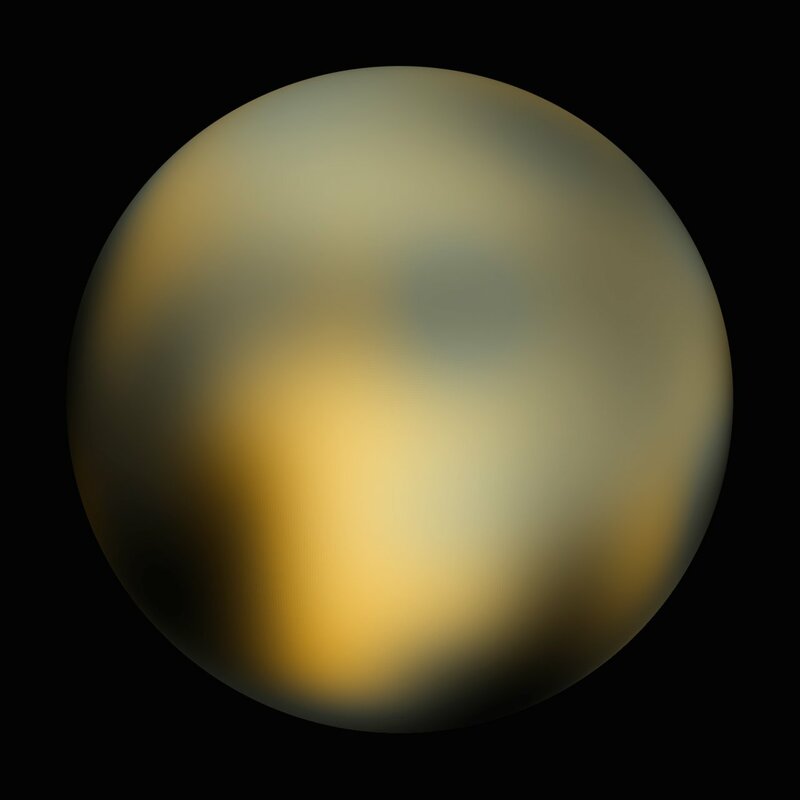 Those 9 years went far quicker than I would have imagined, and in July of 2015 I was one of the many Earthbound observers waiting eagerly for the data that would show us Pluto’s true colours. It did not disappoint. 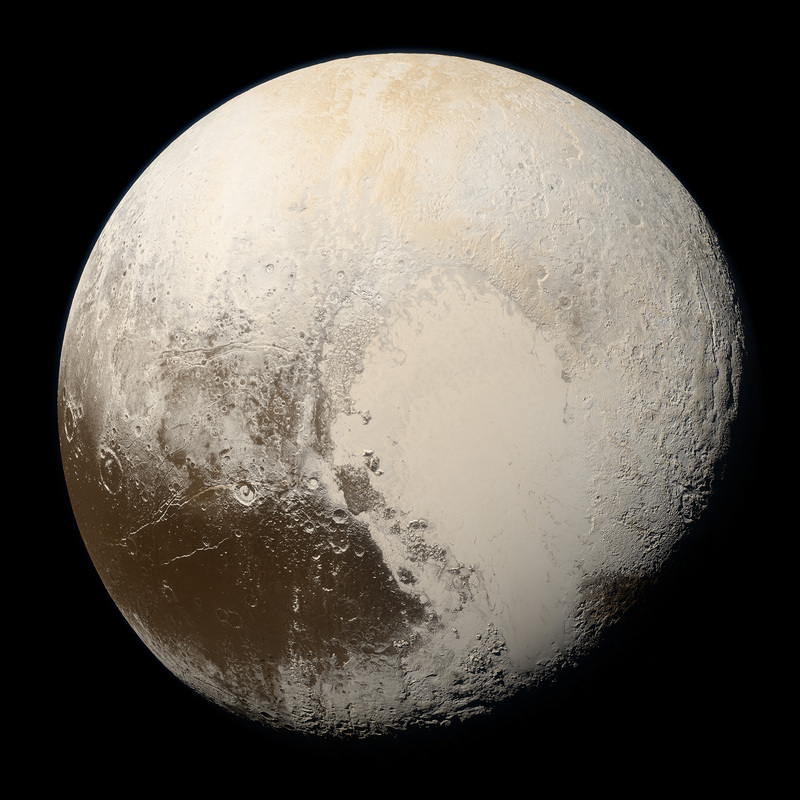 Pluto true colour image from New Horizons. A stark difference to be sure, and the benefit of a spacecraft several hundred thousand kilometers distant, as opposed to the 7 Billion kilometers of distance between Pluto and Earth. This iconic image wasn’t the end of the New Horizons mission, as the spacecraft had plenty of momentum, fuel for small course adjustments, and a huge amount of time to drift through the outer solar system. The mission team’s only goal: To peek ahead and look for objects they could aim at for a future flyby and study. The buzz around New Horizons cooled down for many months as the craft finished transmitting its Pluto data back to Earth. The mission team began looking at all known Kuiper Belt Objects (KBOs) to create a short list of candidate objects for a future New Horizons flyby. After searching through a list narrowed down from the 100,000+ known KBOs, they chose 2014 MU69, mainly due to the small course correction required to send the spacecraft close enough for study. Until just a couple of days before the flyby on New Years, Ultima Thule was little more than a pixel in images taken by New Horizons, but those pixels were important as they allowed the spacecraft to make the tiny course adjustments that would bring a close-up view. Ultima Thule from 2 Billion kilometers distant. The stage was set for Ultima Thule to become the most distant object ever studied closely by a spacecraft from Earth, but there was one major challenge to overcome when observing something this far away. Billions of kilometers of space in between New Horizons and Earth meant that even at the speed of light, a signal would take 6 hours to travel home. Ultimately this meant that all the commands for New Horizons had to be programmed to run automatically, well before the actual flyby. Additionally, with the full power of the spacecraft dedicated to gathering data, it would not be able to transmit any of that data for several hours after closest approach. On top of that there would be the 6 hour delay before the data would even reach Earth. Together this meant that there would be no confirmation of success – or failure – of the flyby until it was too late to fix. This was a one shot deal. All things considered, New Horizons owed humanity nothing. It delivered the goods in 2015 with Pluto and its moons, and anything extra we could tease out of its instruments was just gravy. Still, in a testament to the planning, intelligence, and cooperation of hundreds of scientists, engineers, and mission planners, the flyby was a complete success. Say hello to Ultima Thule. 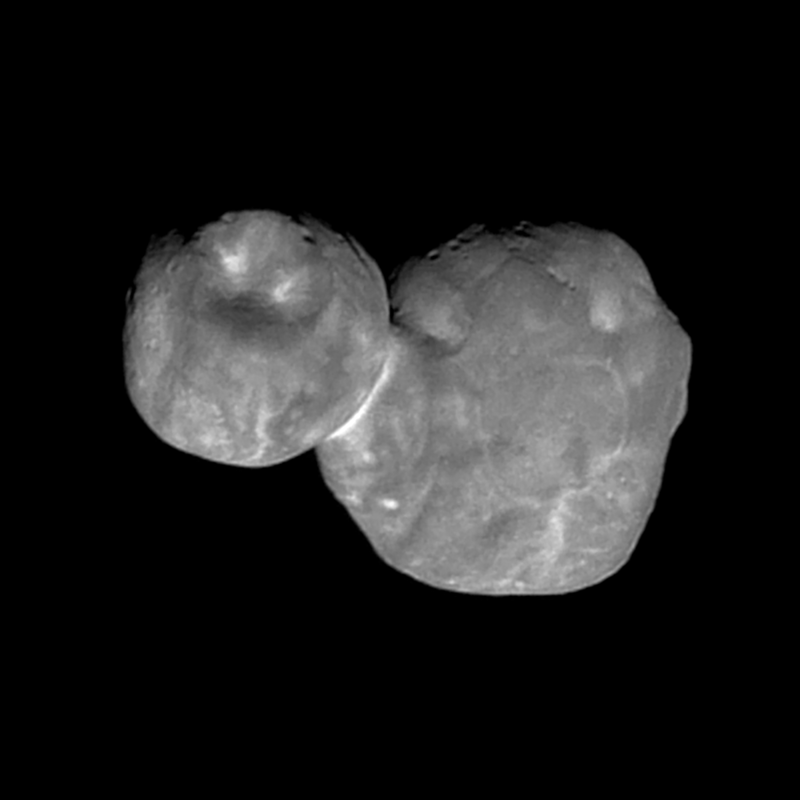 Ultima Thule is what we call a contact binary. It’s actually two icy, rocky, KBOs that smashed together and stuck. Astronomers are salivating over this fact, because contact binaries have never been observed in their original environment, and they tell a dramatic story of Solar System formation, with billions of distinct objects swarming around, smashing each other from chaos into the modern organization of the planets, moons, and belts. This object has remained untouched for 4.5 Billion years, a time capsule from the formation of the Solar System, nearly a billion years before life on Earth was a possibility. The best part is that the story has barely begun to unravel. less than 5% of the data collected by New Horizons has been transmitted to Earth, a process that is expected to take another 18 months. Hundreds of scientific papers will result from the study of this object and the implications it has for models of our Solar System. A true scientific treasure trove. Here is a picture that was returned to Earth just days ago. New Horizons has proven that it is a mission still going strong. Aside from the transmission of data from the flyby, the mission team is monitoring other objects far ahead of the spacecraft, eventually hoping to explore even farther into the depths of the outer Solar System. What other secrets wait for humanity in the darkness? We explore new horizons and seek deeper secrets in our drive to understand ourselves and our home.